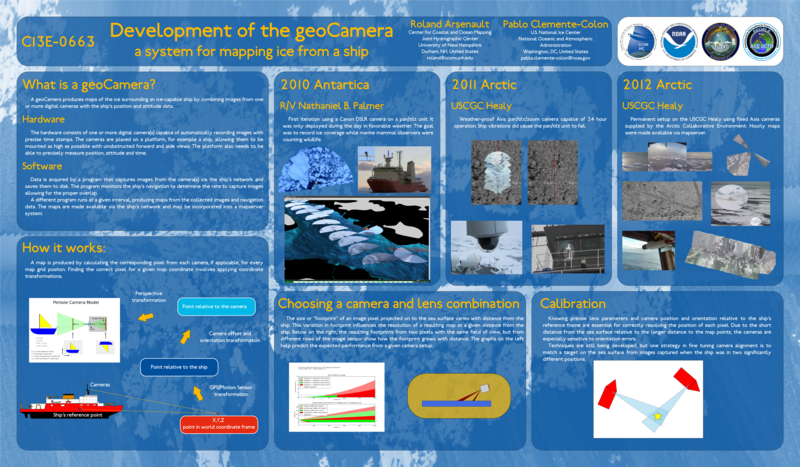 The geoCamera produces maps of the ice surrounding an ice-capable ship by combining images from one or more digital cameras with the ship's position and attitude data. Maps are produced along the ship's path with the achievable width and resolution depending on camera mounting height as well as camera resolution and lens parameters. Our system has produced maps up to 2000m wide at 1m resolution. Once installed and calibrated, the system is designed to operate automatically producing maps in near real-time and making them available to on-board users via existing information systems. The resulting small-scale maps complement existing satellite based products as well as on-board observations. Development versions have temporarily been deployed in Antarctica on the RV Nathaniel B. Palmer in 2010 and in the Arctic on the USCGC Healy in 2011. A permanent system has been deployed during the summer of 2012 on the USCGC Healy. To make the system attractive to other ships of opportunity, design goals include using existing ship systems when practical, using low costs commercial-off-the-shelf components if additional hardware is necessary, automating the process to virtually eliminate adding to the workload of ships technicians and making the software components modular and flexible enough to allow more seamless integration with a ship's particular IT system.